Back in the early eighties, I needed a programmable calculator for engineering studies, and a relative working at Sharp recommended the PC-1500. In hindsight, it was an excellent choice. 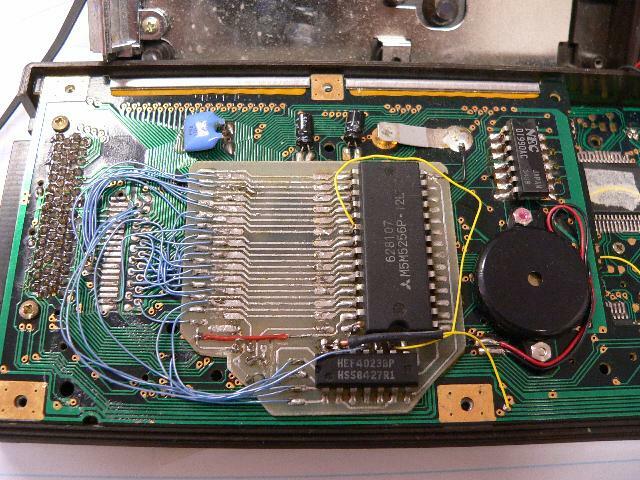 The PC-1500 is more a small computer than a calculator, with BASIC built in, so I immediately started hacking. Wrote some code to examine memory, and before long had the whole thing mapped out. This was before I obtained a copy of the Technical Reference Manual. Once I had the manual, I decided to add as much RAM as I could. 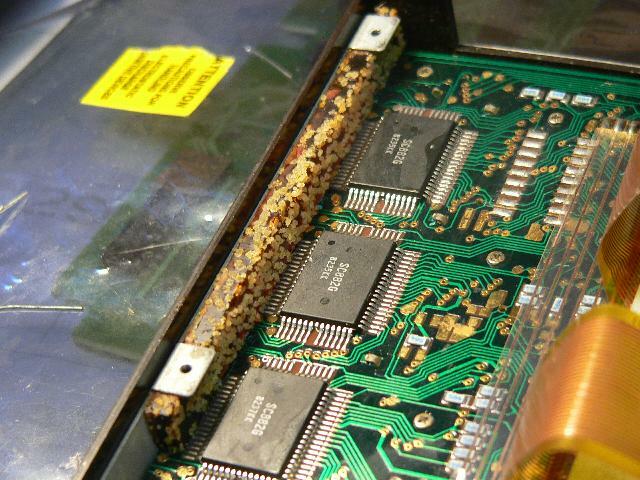 I had the CE-161 16K RAM module, but more is better, right? The display chips are mapped to the 7600H to 77FFH block (512 bytes). The display chips wrap (three times) to the 7000H to 75FFH block. 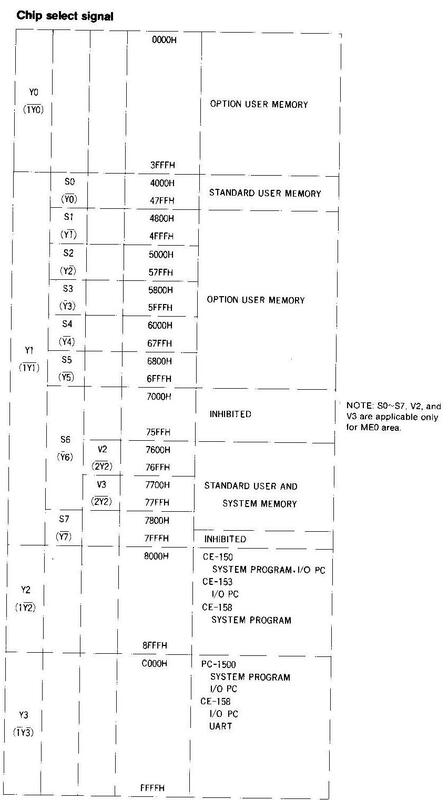 The 2 x 2114 memory chips are mapped to 7800H to 7BFFH. The 2 x 2114 memory chips wrap to 7C00H to 7FFFH. I decided to add a 32k x 8 static RAM chip, mapping that from 0 to 6FFFH. 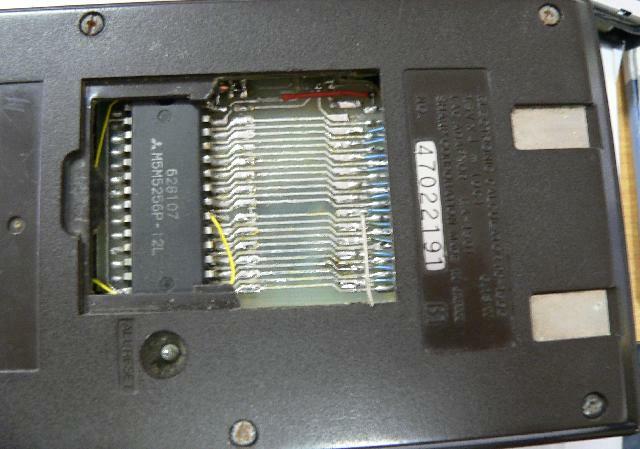 I also removed the 2 x 2114 (1k x 4 each) memory chips and re-mapped the 6116 (2k x 8) to the 7800H to 7FFFH area. This gives me 32k of contiguous RAM, of which I can use the bottom 28k. I made a PCB, with the 62265 / M5M5256 chip, space for an EPROM in the 8000H to BFFFH range, and a 4023 triple 3-input NAND gate (/CE = ME0 * /A15 * /A12.A13.A14 where the first NAND gate generates /A12.A13.A14, the second NAND gate inverts A15, and the third NAND gate generates /CE from ME0 and the outputs of the first two gates). In the years since I last used the PC-1500 the little rubber spacer block inside turned to mush. For what it's worth, here are my notes at the time, also more notes. Kai Bader has done some serious PC-1500 hacking.